A few weeks back I took a dive into Pitching Strategy for 2019 and performed a little exercise where I built my ideal pitching staff for mixed leagues in 2019. I received a lot of feedback on that article; some good, some bad. A few people said I was cherry-picking players (I was) and that it was an unrealistic situation. Most others though took it for what it was; a useful exercise in figuring out what it would take to score well in the pitching categories without committing any more resources than anybody else. Today we’ll do that same exercise on the offensive side and talk about hitting strategy for 2019. 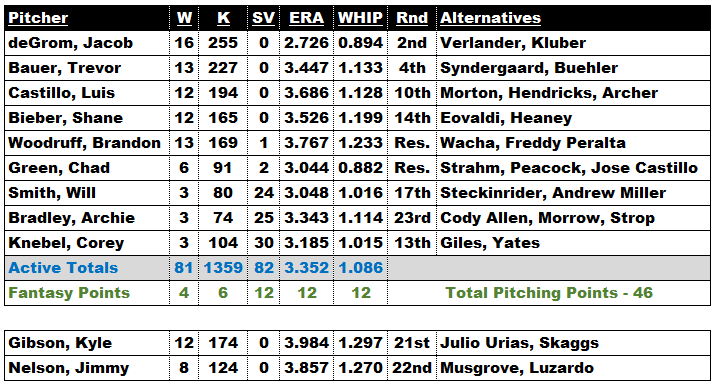 Here’s a quick look back at the pitching staff I built. As a reminder I used rounds 2, 4, 10, 13, 14, 17, 21, 22, 23, and a couple reserve picks to build my pitching staff. Here’s a look at that staff. Using Fantrax data from 12-team mixed leagues in 2018, this pitching staff would have grabbed 46 out of a possible 60 points in the pitching categories. Things would be a little tougher in NFBC leagues, claiming 41 of the 60 pitching points. Either way, I’d be happy as I only used three of my first 10, and six of my first 20 picks on pitching. That means all of my starting offensive players will come inside the first 20 rounds. I like my chances to build a solid offense with those picks in hand. And now let’s talk about that offense. 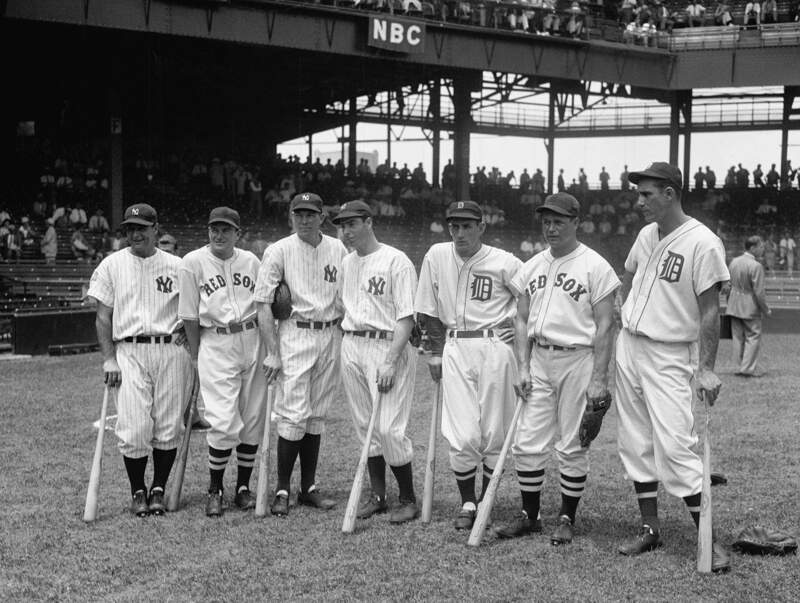 Whereas pitching is going through monumental shifts that are changing the way we play fantasy, the trends in hitting have been slowly building for years and we’ve been able to gradually adapt to the changing landscape. The major trends in offense mean that speed is a little harder to come by; power is plentiful, and the huge increase in strikeouts means we may have to be a little more forgiving on the batting average front. As I said, we’ve dealt with these changes over the last five years, so the strategy it takes will not be any drastic shift. The combination of home runs being so plentiful and stolen bases being on the decline creates quite the little conundrum. Scarcity means one stolen base is more valuable than ever, but if you dedicate a major investment to a one-category wonder like Billy Hamilton or Dee Gordon, you have a ton of ground to make up in home runs. Because of this, I believe it is almost a requirement that my first four or five hitting selections must pull double duty. I’m looking for hitters who can hit 25-plus bombs and snag 15-plus bases. And to think no one has ever thought of this before… Yes, everyone else in your league is trying to do the same damn things. You just have to be better at it. Hopefully, drafting our entire offense in the first 20 rounds will make this easier. Drafting multidimensional hitters early also means you have a lot of freedom later in the draft because you’re not chasing a specific category. Remember, you’re not aiming at first in any one category. You’re targeting third or fourth in every category. This approach not only makes the later rounds of the draft more enjoyable, but a balanced offense also means you’re likely in the hunt in almost every category as the season progresses, and you can use the waiver wire and trades to gain ground with just a move or two. None of this is earth-shattering fantasy strategy. It just reaffirms my belief that the most successful approach in hitting strategy is all about balance. I may not be the Dali Lama of fantasy, but those are my wisest words. Now to put them into play. A little refresher on this exercise first. My pitching selections have left me with rounds 1, 3, 5, 6, 7, 8, 9, 11, 12, 15, 16, 18, 19, and 20 to build my offense. I’ll also tack on a couple reserve picks I think could pay off. For the player pool, I am using current Fantrax ADP to draw from. For the purposes of this exercise, I assumed the No. 7 draft slot. I stuck to this very strictly for the first five rounds, but after that just used the corresponding round, as I did not adjust for the snaking of the draft. As far as stats go when it comes time to figure out how my team stands against the competition, I’ll use my own projections. They are pretty conservative and I’ll show each player’s projected numbers so you can see I’m mostly sane. Here’s the offensive juggernaut I came up with… And yes, it’s cherry-picked. It’s unlikely I’d be able to build this exact offense, but the picks fit into the ADP and are all within the realm of possibility. And remember, it’s all about the process. I’d suggest going through this exercise for any league you’re in. As you can see, according to my projections, this offense would net me 56 of the possible 60 hitting points based on 2018 data. If I use 2018 data from NFBC 12-team leagues, my hitting points drop to 44, as my numbers in R, HR, and RBI drop to middle of the pack. That’s still averaging a fourth-place finish in each of the hitting categories, but I might go back through my picks and try to swap out speed and average for a bit of power. In both models, I was projected to win SB and AVG by a pretty wide margin. Sounds nice, but that’s wasted value. Swapping out Adam Eaton or A.J. Laureano for more power would probably boost me in the power categories without costing me any points in speed or average. As I went through this process there were a couple of challenges. One was when to draft a first baseman. The position is not as deep as many people think. Joey Votto in the fifth round is not a pick I’m in love with. I might be happier with Jose Abreu a little bit later, but you run the risk of missing out on the position and settling for a Yuli Gurriel type. The other position that tugged at me the entire time was catcher. I don’t think the top options are strong enough to reach for early, but I also don’t think you can wait until the end and just take what’s left. I feel like the options I ended up selecting are a nice compromise. As far as the projections go, feel free to nitpick. Find some you like better and go through this process. 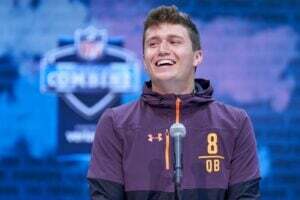 It’s never going to work out exactly this way when draft day comes, but you’ll definitely have a solid idea of the type of offense you want to build. 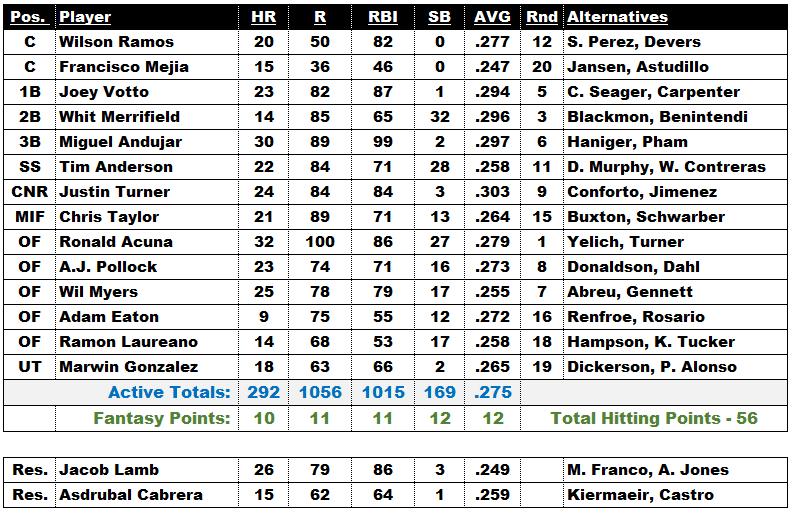 Here are the average stats for each position in the standings for Fantrax and NFBC 12-Team Standard leagues. I have to be honest, doing these two articles is just as much for me as it is you. Things will never work out the way it does on paper (excel), but the process really helps you find the strengths and weakness of the player pool. I’d also suggest you track your projected stats as you go through a draft. It might be hard in a fast online draft, but it will help keep you on target for a competitive team. The key in my opinion is never getting too imbalanced, forcing you to chase categories late in the draft. That’s when I hope I can just take the best player and that’s when many leagues are won. As usual, let me hear it in the comments below. Hopefully I’ve helped you at least think about how you’ll approach drafts this year and maybe affected both your pitching and hitting strategy. Did you find Doug’s take on Hitting Strategy useful? For more great rankings, strategy, and analysis check out the 2019 FantraxHQ Fantasy Baseball Draft Kit. We’ll be adding more content from now right up until Opening Day!